Once upon a time CARS used to have a "JUNK SALE" but this was wound up when it was realised that most Chelmsford Radio Amateurs all had a garage full of Junk and their XYL’s had forbidden them to import anything more! (What is a Garage for? - Answer:- Storage space when you cannot get anything more in the roof!). To provide a more useful sale the "Quality Table Top Sale" was started a few years ago and this proves to be more attractive. It is surprising what is sold - (computer CRT Monitors and large CRT TVs are NOT popular!) - most other items do change hands. A number of CARS Members DID have a good look in their shack and brought along a good range of items to sell. It consisted of good condition Amateur, Audio, Electronic, Electrical, Photographic, Computer and associated equipment. A few tables had Silent Key equipment for sale & Zippy had 2 tables filled with his "overflow equipment" which he nearly sold out of. Zippy also kindle donated a very large clock and onther item to the Raffle which were soon Hoovered up. Thanks Zippy for your generosity. Unfortunately David Penny, G3PEN telephoned in ill - hope you soon recover, we missed your presence and tables. CARS were very pleased to see a happy band of Amateurs from LEFARS Club who "thought the selling pattern was not as brisk as last year but it was a good Social event" - thanks for the report. Thank you Colin for organizing it. 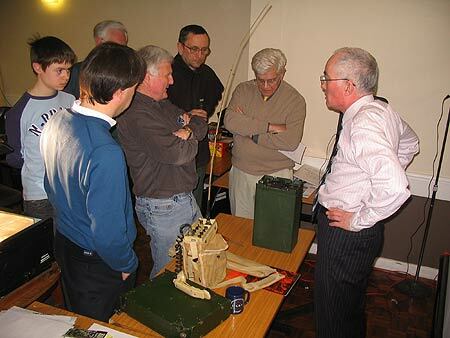 7.30pm, Tuesday 5th May, 2009 "Honeybees, Amateur Radio and Radar". Chairman John welcomed CARS Members and visitors including Adrian M0ABY and Mavis G0XBC from Wheathampstead. In introducing his presentation, Geoff said he had been a Beekeeper for 50 years and had got into Beekeeping to improve apple production. Everyone must have heard or seen on TV the problems facing the Honeybee at present but one must remember that in 1904 there was the “Isle of Wight Disease” which decimated the bee population. Solutions were found and with bees imported from Holland, beekeeping thrived in England. They imported the bees in Skeps – a special woven straw top hat in which the bees built their home on wax sheets, maybe 5 or so. At the end of the year the Skep was burnt to drive the bees out and obtain the honey either directly as comb or squeezed to get the liquid honey. The nearest we get to this today is “Cut honey” – Geoff showed a sample of this. Years ago the main aim was to obtain Wax for candles in the Monasteries – paraffin and fat candles produce a black sticky smoke which could damage the pages of script the Monks were working on – Wax Candles produce a clean vapour when burnt. The colony is made up of a Queen and at this time of the year with 500 Drones (Males) with 20,000 Workers which are females which increase to 60,000 in summer. Geoff then showed a series of photographs which showed the Honey Bee, Wasp and Flies which looked like Bees. Bees have their Antenna at the front – “I have an Aerial not an Antenna”. Years ago we had 26 varieties of Bumble Bee but this has now reduced. There is also a Solitary Bee and these are slightly smaller than the Honeybee and only have 5 or 6 in their colony. Bee Keepers use a Smoker to control the Bees – this replicates the Forest Fire – the Bee gorges itself and therefore not inclined to sting. Farmers are now educated to spray their fields early in the morning, typically 4 or 5am. 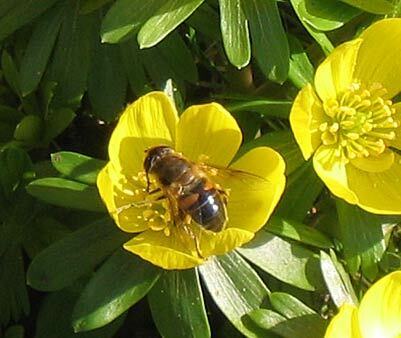 By the time the spray has set – the bees by now are not so vulnerable. In 1851 the Rev Lorenzo Langstroth in America realised that bees need a minimum Bee-Space (8mm) and also produced a removable wax frame and installed a number in a wooden “Hive”. His development improved the quality of the honey and saved thousands of bees being killed at the end of the season, it also started a series of hives including the National, Smith and the William Broughton Carr (WBC) which Geoff said was liked by amateurs and lady beekeepers because it was double skinned and as it was usually made from cedar it was light however professionals preferred the heavier National. The frame is now wired for extra strength – samples were passed around. Geoff went into details regarding the amount of bee entrance needed at the hive to enable bees to regulate the air flow and keep out mice. The initial wax six-sided cell is the most perfect shape – it cannot be improved by man or computer. The bee then draws this out, fills it with honey and then finishes it off with a cap of wax. They like the “Forget me Not” flower in early spring and tend to ignore the Daffodil. A swarm is where a new Queen sets off with maybe half of the hive of bees with the idea of setting up a new home. 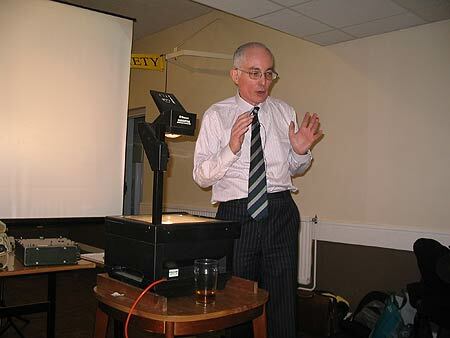 Geoff said that as a radio amateur and beekeeper he was very aware of Sun Spots. Between 1645 and 1715 there were only 40 to 50 Sunspots and called the Maunder Minimum. Another poor period is referred to as the Dalton Minimum around 1815. Using X Band Radar it has been found that the pheromone from a Drone can be detected 800 metres down wind – far further than originally thought. He said that tagging the bee with a small aerial and using Radar enabled it to be determined that the “Bee Dance” which the bee uses to tell the rest of the hive where a good supply of nectar is. Also the Bee knows where it goes using direction and distance – not as per GPS as we would use now. Local Pollen produces hay fever so eating local honey produced within say 3 miles can reduce the effect and this has been now been scientifically proved. Repeatedly heating the honey does reduce its health giving properties. Answering a question about the Vorroa Mite, Geoff said that a group of Scottish bee keepers were trying to breed a Vorroa Mite resistant bee. “How do you find the Queen?” – with difficulty – keen eyesight and years of experience was the answer – a dab of nail varnish helps. He mentioned the Radio Amateurs' Beekeeping net on 80 metres. As this is a general interest subject it was good to see so many XYLs in the audience. Thank you Geoff for an interesting evening. CARS had its now famous Raffle - only £1 per Ticket. After the Raffle has been drawn CARS welcomed Mark Haynes M0DXR who wished to promote the Contest University. Do you want to learn about Sport Radio - Contesting? Have you ever wanted to brush up on your contesting skills? Are you new to Amateur Radio and want to get involved with the exciting and fast paced action of contesting? If the answer is YES to any of these questions, then you should have stayed & hear what Mark has to say. The name Contest University UK is based on the highly successful course first held in Dayton, Ohio last year where 120 students successfully participated and completed a day-long course covering the main topics associated with contesting. Thank you Mark for your euthastic presentation which you timed very well. 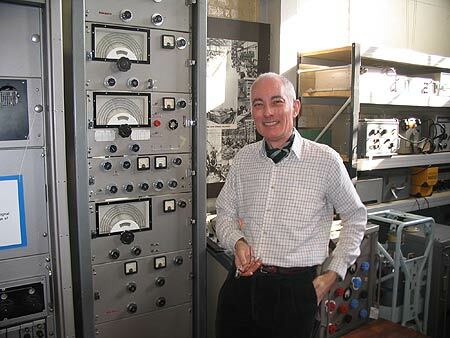 Michael O'Beirne, G8MOB, standing in front of the HR24 Receiver at Sandford Mill. 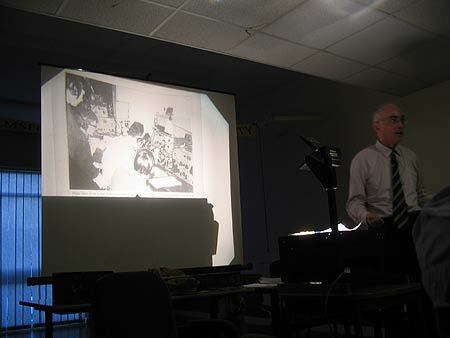 Michael is an author for the Vintage Wireless Magazine "Radio Bygones" and is an expert on Military Communications. He became interested in Chelmsford through his initial visit to Sandford Mill where he met Dr Geoff Bowles, Keeper of the Science & Industry Museum & Geoff Lovegrove, G7KLV, CARS Liaison Manager and green fingered mender of everything electronic. Michael was interested in the HR24 Receiver but soon noticed that behind the Marconi Hut, was displayed Marconi Radios of every description. Michael was picked up from the railway station by John Yates, G1UZD, CARS Programme Manager and brought to Beehive Lane in fine style complete with ruck sacks of radios. 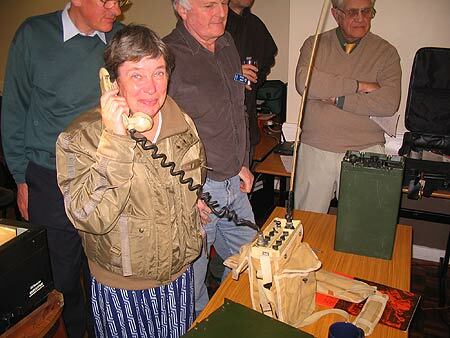 Chairman, John G8DET started the evening off with the usual requests for Operators for International Marconi Day on 25th April and Windmills on the Air weekend on 9/10th of May at Stock Windmill and organised by Patrick, M0XAP. 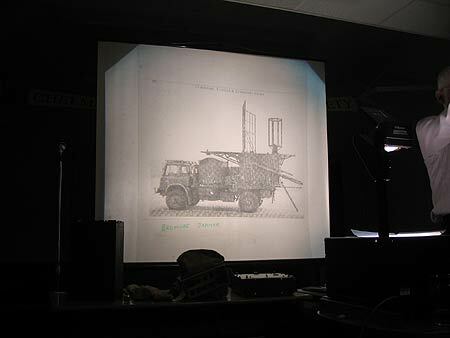 John introduced Michael who said that he felt happier standing infront of a conventional overhead projector rather than a digital set-up. He had a number of lovely young ladies at work who organised his digital work for him and he liked the flexibility of Pen & Ink. Michael said he was in the Army Cadet Corp of his boarding school. Michael with Eddystone headphones on in front of a 19 Set. Michael concentrated on Army comms but touched on the problems of inter-Service comms. 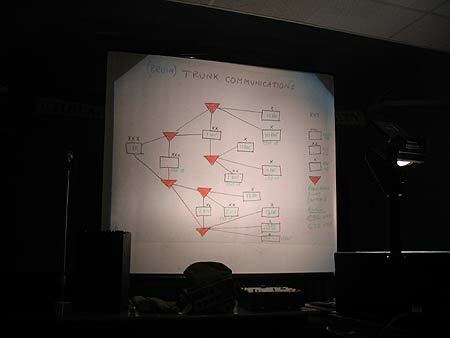 This was an introduction to the way in which military communications are run from both a theoretical and practical perspective. An overview of army organisation: from platoon to divisions, and between Teeth arms and Support arms. During the Break Period Michael demonstrated some of the charateristics of the radios he had brought with him. 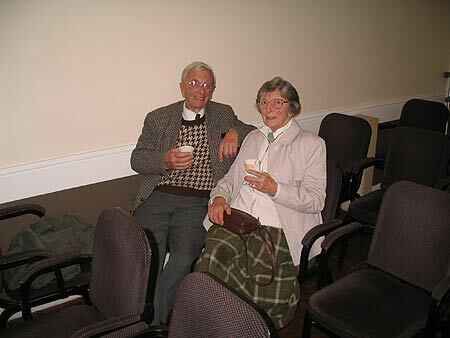 CARS President G5HF enjoying a "cuppa" with Ethel. John Yates in discussion with Michael with CARS Members looking on. 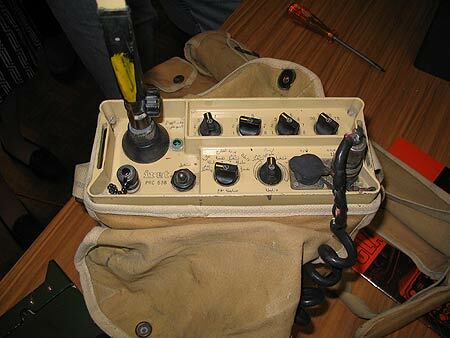 Technical requirements of radios (electronic and physical). Typically the Military Radios are expected to work in greater temperature ranges than domestic equipment and examples were quoted of -40 to +50 degrees C with immersion in 1 metre of water for 1 hour being typical. A Member's XYL demonstrating an Iraqi Radio. Notice the yellow VHF aerial. 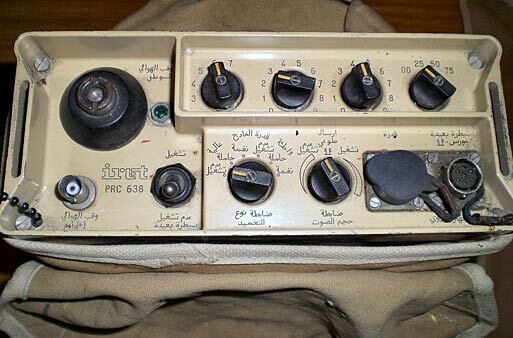 Close-up of the Iraqi Radio made in Italy. Michael thought was better than the British Army equivalent. Extra Close-up photograph of the IRET - PRC 638 Radio by Murray, G6JYB. Notice the markings in Arabic. The green bezel to the right of the Aerial Mount is illuminated Green on Receive & turns to red on Transmit. A beautifully made "Selector" box used on Transmit & Receive to enable a Receiver to work in close proximity to a powerful transmitter. plated tuning capacitors - must have cost a fortune to made. 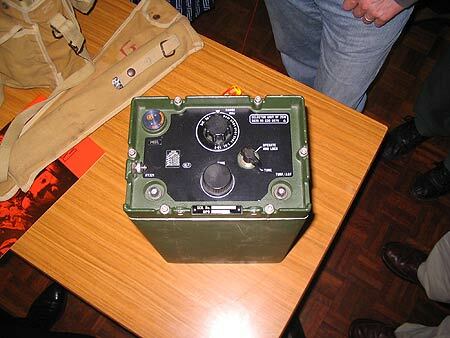 It was housed in a rigid die cast aluminium casing with seals & normally pressured with inert gas. Introduction (briefly) to Electronic Warfare. A number of questions were posed during "Question Time" including the topic of "Friendly Fire". In noting there is nothing Friendly about being fired on Michael pointed out there was two types of Fog. Weather generated fog and the "Fog of War" where it is very difficult indeed to tell what is happening to who! Examples were quoted of where trigger happy Allies had shot up "Friendly" ground troops in the mistake for the enemy even though Yellow patches were visable. As this was an interesting subject, a number of visitors came from local Clubs. CARS had it's now famous Raffle with a table top of Raffle Prizes - winning tickets were drawn by Michael. 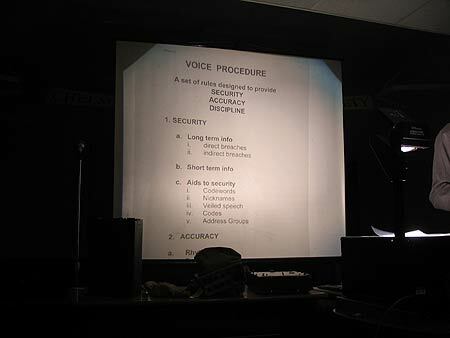 Thank you Michael for introducing us to the exacting requirements of Military Radio Equipment. Perhaps you could return and tell us about some more of the equipment you so obviously know so much about. Last revised:- 9th April 2009 when this page was created.